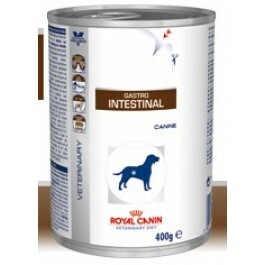 Royal Canin Gastro-Intestinal is a complete dietetic feed for dogs formulated to reduce acute intestinal absorption disorders, and promote nutritional restoration and convalescence. Highly digestible ingredients. Increased level of electrolytes and essential nutrients. Highly digestible ingredients with Increased level of electrolytes and essential nutrients. High energy - adequate energy content to meet the needs of adult dogs without overloading the stomach. EPA/DHA: to help maintain a healthy digestive system. COMPOSITION: meat and animal derivatives, fish and fish derivatives, cereals, derivatives of vegetable origin, oils and fats, minerals, yeasts. ADDITIVES (per kg): Nutritional additives: Vitamin D3: 380 IU, E1 (Iron): 7 mg, E2 (Iodine): 0.35 mg, E4 (Copper): 2.3 mg, E5 (Manganese): 2 mg, E6 (Zinc): 21 mg.
Royal Canin Gastro Intestinal should be recommended by your veterinary surgeon. For detailed information on feeding amounts and how this food can help your pet, please consult your veterinary surgeon.